This summer, Alan Wilder will be selling a large selection of musical / studio equipment, vinyl & memorabilia at auction. Many items are very collectable and hold special value having been used extensively in the recording sessions for classic Depeche Mode and Recoil albums, as well as live performances on the Black Celebration, Music For The Masses, World Violation and Devotional tours. All further information on recoils official website or on the Recoil-Blog. The limited (1000 copies) Join In The Rhytm Of Machines EP of Nitzer Ebb & Die Krupps is almost sold out. Neuwerk have managed to secure the last copies for the fans, which can now be ordered through the new Neuwerk Online Shop. All EP’s are signed by both bands. 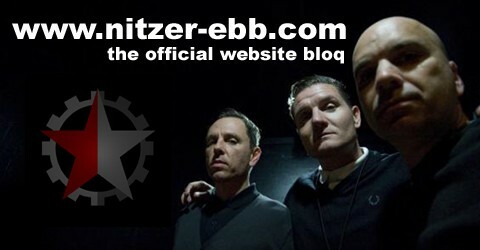 Update May 28: get the Nitzer Ebb merchandise at the neuwerk online shop as well! Nitzer Ebb Live in Spain / Date Change for Utrecht Show! Two new dates in Spain are confirmed on NEP 2011 tour schedule: Barcelona on December 16th and Madrid on December 17th. Check Nitzer Ebb Website for complete Tour Schedule! UPDATE Utrecht Show: The band will play at the Summer Darkness Festival on 31st of July 2011! The NEP Website http://www.nitzer-ebb.com supports Stefan Albinsson’ fundraiser in memory of Bobbie Glennie. Please support the foundation to fight Cancer! Learn more about Stefan’s participation and contribute to the cause. Follow the link below to visit Stefan’s personal web page and help him in his efforts to support LIVESTRONG. Note: Stefan is a longtime friend of NEP webmaster and a supporter of nitzer ebb website since the beginning. Both, Stefan and myself, we are nitzer-ebb dot com!! Take care my friend! R.
Indomina Media, Inc., the wholly owned operating division of The Indomina Group encompassing film production and distribution, interactive gaming and music, today announced the premiere of “Axis of Envy,” the debut single and music video by The Shadow Bureau featuring vocals by Wolfgang Flür with background vocals by Isabelle Erkendal, of the Swedish vocal duo West End Girls. The Shadow Bureau, a musical endeavor led by renowned composer, producer, singer/song writer and multi-instrumentalist Bon Harris, will feature various artists performing original songs inspired by Indomina Media’s theatrical film releases. The premiere video features vocals by the iconic Wolfgang Flür, a former member of the pioneering and highly-influential German electronic rock band Kraftwerk and takes inspiration from Indomina’s debut theatrical release “True Legend” – Yuen Woo Ping’s martial arts feature starring Vincent Zhao, Zhou Xun, Michelle Yeoh and the late David Carradine, which opens in theaters on May 13th.